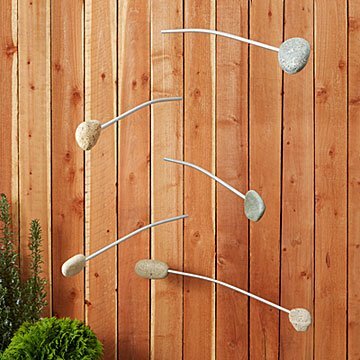 Add a touch of zen to your porch or garden with this water and air-mimicking mobile. As the ocean swirls and the wind blows, all living things move with the energy of the universe. Inspired by kinetic energy and the ebb and flow of both the air and water, designers Arra David and Anne Johnson created this serene outdoor mobile. Made from recycled materials and handpicked sea stones, this sculpture weighs approximately fifteen pounds and moves constantly, even without the force of wind or other elements. Hang from a sturdy branch or porch ceiling to enjoy the calming motion and reflect on the universality of motion. Made in New Hampshire.